Price Before: 15,990; Only 1,308/mo. for 12mos. LetÃÂÃÂÃÂÃÂs face it: Buying a laptop is an opportunity to grow. You want what you purchase to last for years. ThatÃÂÃÂÃÂÃÂs why we designed the Ideapad S130 with a special protective finish to guard against wear and tear, as well as rubber detailing on the bottom to keep things calm and cool and carrying on longer. Rest easy with the Ideapad S130. With up to 8 hours of battery life, you can count on it when youÃÂÃÂÃÂÃÂre on the go. Avoid running out of battery life while running around town. Whether youre watching a video or writing that paper due in the morning, it will all look sharp on the Ideapad S130 HD display. 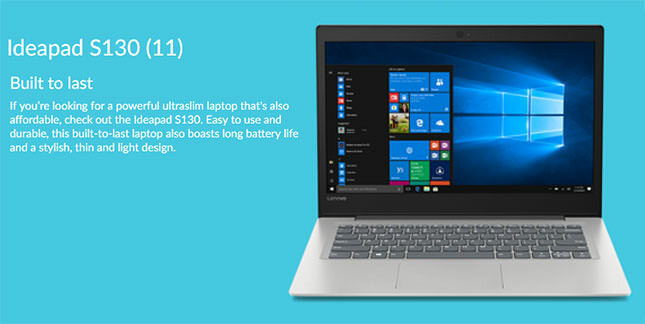 At just 1.44 kg, the ultraslim Ideapad S130 is great for use on-the-go. Just slip it in your bag and hit the road youÃÂÃÂÃÂÃÂll barely notice youÃÂÃÂÃÂÃÂre carrying it.